One of the great things about the public domain is that very nearly everything eventually falls into it. It is only a matter of time before every work — every opera, fresco, novella, tapestry, napkin scribble and lecture note — gracefully ascends into the big commons in the sky. While the amount of time it takes for this graceful ascent to occur varies from country to country, and exactly how many works are sitting up there is something that researchers are still scratching their heads over, it is safe to say that the public domain is very very big, and that there is lots and lots of good stuff in it. So how can I find interesting public domain works to enjoy? At the moment there are many wonderful non-profit projects like the Internet Archive, the Open Library, Project Gutenberg, and Wikimedia Commons whose mission it is to bring as much high quality cultural and historical material online as possible for anyone to download, print, scribble on, view on their phone or eBook reader, make collages out of and so on. But apart from things I already know that I might be interested in (from Shakespeare to Schubert to Sherlock Holmes) how can I find other things that I might like? Typically one might look to things like the London or New York Review of Books, the TLS, or newspaper supplements to serendipitously discover interesting works — but these tend only to cover public domain material when new editions are published, when there are special exhibitions or when there is a special anniversary or centenary. There are numerous periodicals and blogs that include discussion of public domain works, but many of them are quite specialised (e.g. aimed at academic peers, audiophiles, or art historians). The Public Domain Review is exactly what it says on the tin: a web-based review of works which have fallen into the public domain. Each week an invited contributor presents an interesting or curious work with a brief accompanying text giving context, commentary and criticism. Over the next couple of months we are going to be looking out for interesting material to review, and interesting reviewers who might consider contributing. 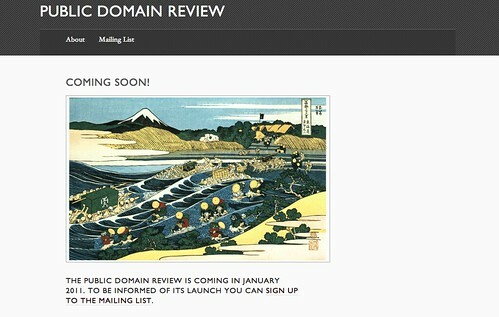 The aim is to launch on Public Domain Day 2011 (1/1/11) and to keep a steady pace of a review per week. If you are interested in receiving the reviews in your inbox, you can sign up to the mailing list! This entry was posted in ideas, openknowledge, projects, publicdomain. Bookmark the permalink. Comments are closed, but you can leave a trackback: Trackback URL. I really think this is a good idea – reviewing, ranking and discussing public domain works. Kudos to you for taking the initiative to actually do that! I just wanted to let you know that the brazillian government has had, for some years, a site for searching and retrieving for brazillian and portuguese language public domain works: http://www.dominiopublico.gov.br/. It has books, music, and other media. A lot of interesting stuff in there, like, for instance, the complete works of Machado de Assis.